The website Earlyradiohistory.us make a reference to the Baldwin Radio company. As usual, the reference is well-cited. It comes from two good sources: A 1911 memorandum from a radio division under the Bureau of Steam Engineering, and a transcription of recording by Admiral Arthur Japy Hepburn [LINK] made by the Office of Naval History. I've condensed the quote for brevity. "One day, while opening his mail, Hepburn came across a letter from Salt Lake City... The writer, a Mr. Baldwin, stated that he was sending a pair of telephones, which he had patented, and requested that they be tested... They weighed about a pound, and were of radically different construction. The headset consisted of a piece of clock spring affixed to each phone and loosely bound together by hemp twine. Dr. [Louis Winslow] Austin, of the Navy's Radio Research Laboratory, looked at them and laughingly took them for the requested testing. A few days later he informed Hepburn they were about twice as sensitive as any he had tested and advised him to obtain more for quality tests..."
The original headphones were uncomfortable, and some redesign was still necessary based on feedback from the Navy. Nathaniel Baldwin came up with a set of two leather-covered spring-wire rods dangling from each end. These each had an earphone on a spring clip so they could be adjusted vertically. Baldwin did not patent this design element and it consequently was stolen / became a standard. But the Navy needed to buy in quantities that Baldwin couldn't make in his kitchen. When offered, Baldwin refused to relocate from Utah to a navy yard to use their facilities. Ultimately, Hepburn brokered a deal with John Firth at the Wireless Specialty Apparatus Co. to handle the manufacturing for Baldwin. In 1914, he started a the The Baldwin Radio Company in East Millcreek, UT. The plant was powered (apocryphally) by a hydroelectric generator on East Mill Creek which he made out of bicycle wheels and piano wire. Most contemporary sources state this factory The company peaked at 150 employees. This website pegs it at 300. Different sources put their annual sales at $2 million in annual sales in the 1920s having moved about 200k units in 1922. Baldwin was an odd duck. He was a fundamentalist Mormon who studied at Brigham Young Academy (later renamed Brigham Young University), and eventually earned an electrical engineering degree from Stanford University. Subsequently he began teaching at his alma mater. In 1905 Baldwin lost his professorship for speaking out in favor of polygamy. The practice was then illegal in the United States, and formally banned by the LDS Church in 1890. Firing Baldwin did nothing to cool his ardor for sister wives. But that begets other questions. 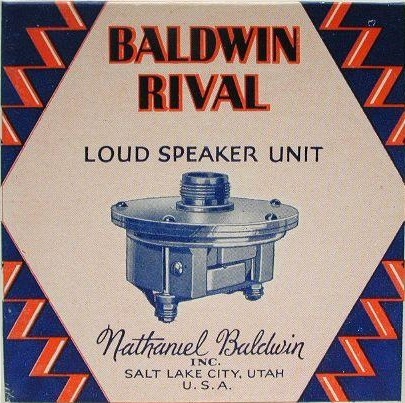 At different times, Baldwin employed Philo T. Farnsworth, the inventor of television and James B. Lansing, founder of JBL speakers. Were they polygamists? For Lansing I can only say probably not. But Farnsworth was the real deal. Philo was actually married to 4 different women: Margaret Yates, Margaret Adams, Agnes Ann Paterson and Mary Priscilla Griffith. More here. Farnsworth was arrested in 1886 for polygamy but since the authorities couldn’t prove the charge, he was acquitted. By 1924, Baldwin was bankrupt. Competition in a rapidly expanding tech market undid his company. He made some bad decisions and fell for some scams as well. Baldwin himself was convicted of mail fraud in 1930 and served two years at McNeil Island Federal Prison. He died in 1961. His factory became an art, retail and performance space in 1996.